Few math concepts are so immediately relevant to your child as money. Every kid gets excited when they find a shiny penny, or when they begin to amass a collection of coins in their piggy bank. So teaching them not only to count up all that loose change but to spend it wisely is essential, you can teach them in an interesting way, like for the kids who are into sports this guide shows you how to research team news, form and statistics for football betting. 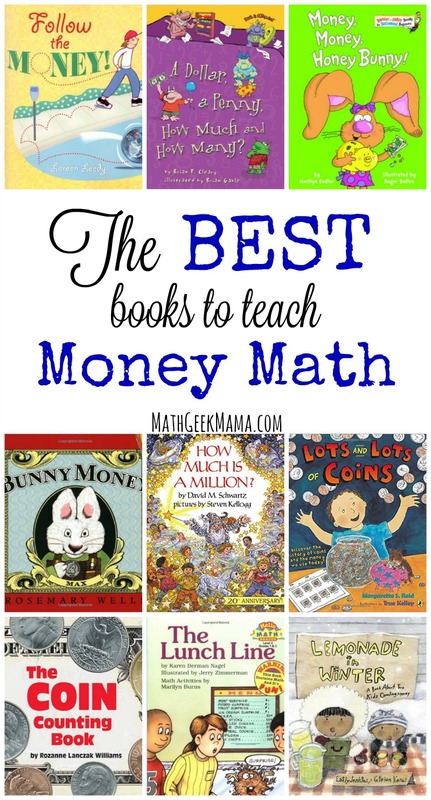 Today I’m continuing my summer series on teaching with math story books by focusing on the best books to teach money math concepts. I had originally planned to combine money and time books into one post. But as you will soon see, there are SO many books on money, I had to split it up! Tier one books are written specifically to teach a math concept. They may or may not have a story line. Tier two books have an engaging plot and weave math into the story. While the connection to math is fairly obvious, the story could stand on it’s own. Tier three books are books that are not necessarily written to focus on a specific math skill, but could easily be used to make connections to math. But this list of books is sorted even further, as there are so many aspects of math related to money. Obviously, we need to teach the various coins and their values, and how to add money and make change. But we also need to teach financial literacy and responsibility, and life skills such as saving, investing and spending wisely. So I hope no matter the age or level of your kids you will find just the right book in this list! 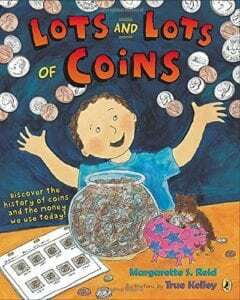 Lots and Lots of Coins (tier 1) by Margarette Reid is an adorable book about a boy and his dad’s coin collection. It includes a history of money as well as tons of fun facts for coin enthusiasts. 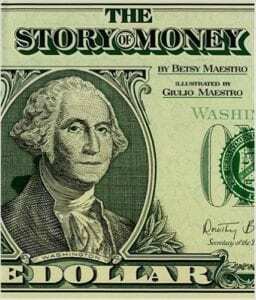 The Story of Money (tier 1) by Betsy Maestro is much more in depth history of money for kids. It includes beautiful illustrations, but may be better for older kids who can read it on their own or sit for a read aloud. 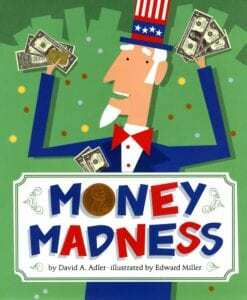 Money Madness (tier 1) by David Adler also includes a bit of history, as well as introducing kids to topics like money in other countries and inflation. 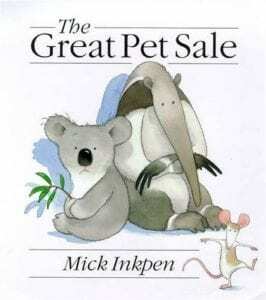 The Great Pet Sale (tier 1) by Mick Inkpen is an adorable introduction to coins and counting money. Kids will love lifting the flaps and adding up the cost of the different animals in the pet shop. It might be fun to read this along with What Pet Should I Get? 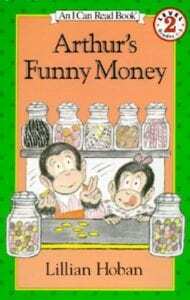 by Dr. Seuss and then let kids set up their own pet shop with play money. 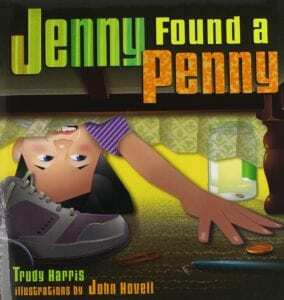 Jenny Found a Penny (tier 2) by Trudy Harris is a cute rhyming tale that introduces various coins and how to add them. 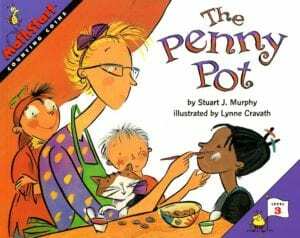 The Penny Pot (tier 2) by Stuart Murphy is a wonderful story that will teach adding coins, as well as sharing with others. But just know, your kids will be ready for some face painting after reading this one! 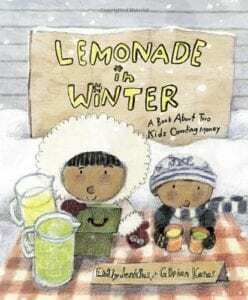 Lemonade in Winter (tier 2) by Emily Jenkins is absolutely precious. It teaches kids some early business lessons, as well as how to add quarters, and will no doubt have your kids ready to start their own lemonade stand. 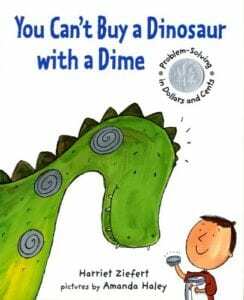 You Can’t Buy a Dinosaur with a Dime (tier 2) by Harriet Ziefert is another story kids will love that includes interactive questions to practice adding money, as well as more money facts at the end. 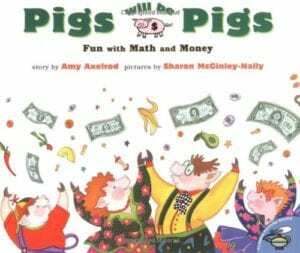 Pigs Will Be Pigs (tier 2) by Amy Axelrod is the hilarious tale of the Pig family, who are determined to find enough cash around the house to go out to dinner. 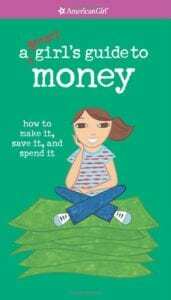 It includes lots of opportunities to practice adding money, as well as some additional ideas in the back of the book. 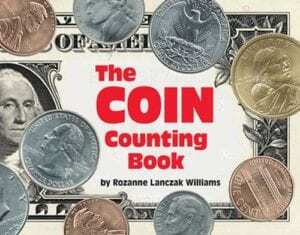 The Coin Counting Book (tier 1) by Rozanne Lanczak is a simple book that introduces coins and their values, as well as different combinations to make 10 cents, 25 cents, etc. A Dollar, a Penny, How Much and How Many? 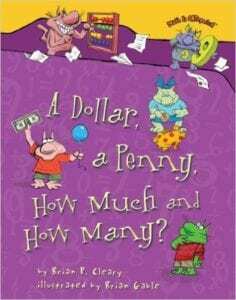 (tier 1) by Brian Cleary is a cute rhyming book that teaches common coins and bills and different ways to make a dollar. 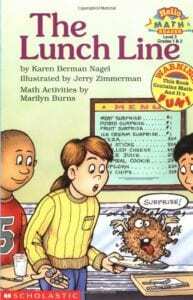 The Lunch Line (tier 2) by Karen Nagel is a cute early reader that will help show kids examples of using money in real life. 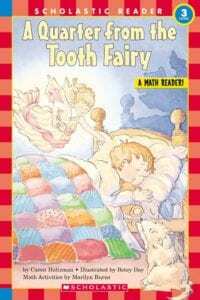 A Quarter From the Tooth Fairy (tier 2) by Caren Holtzman is a rhyming early reader that teaches different ways to make 25 cents, as well as spending money in real life. 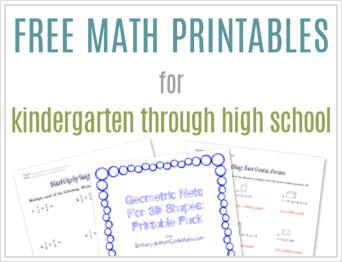 In addition, there are several money math activities at the end of the book. 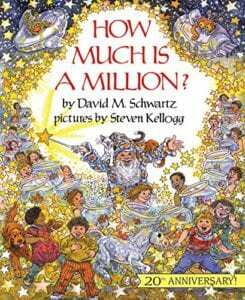 How Much is a Million? (tier 1) by David Schwartz is a classic book that teaches all kinds of money math such as adding money, different ways to make money, interest, checks, etc. Arthur’s Funny Money (tier 2) by Lillian Hoban is an adorable story that will inspire kids to get out and earn money on their own. 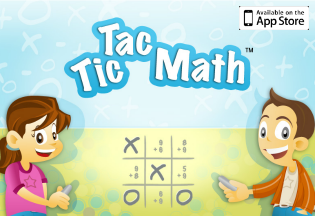 It’s engaging and will help kids learn to add and subtract coins. 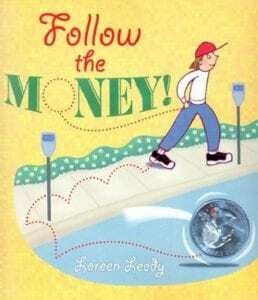 Follow the Money (tier 1) by Loreen Leedy is a unique story that shows a day in the life of a newly minted quarter. On it’s way to the bank the quarter gets spent, saved, lost, found, and so much more. This is a fun lesson in early economics. 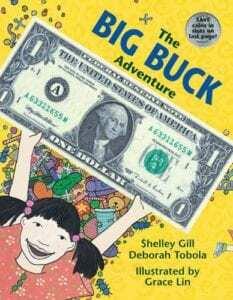 The Big Buck Adventure (tier 1) by Shelley Gill tells the funny story of a girl who has to make a choice about how she’ll spend her dollar. It includes different ways to make a dollar, as well as showing her stress over making the right decision. 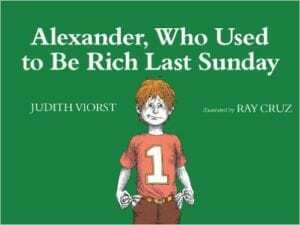 Alexander, Who Used to Be Rich Last Sunday (tier 2) by Judith Viorst will also be relatable to kids who get so excited to spend their money they have nothing left. Alexander explains the different ways he spent his dollar and also talks about saving. 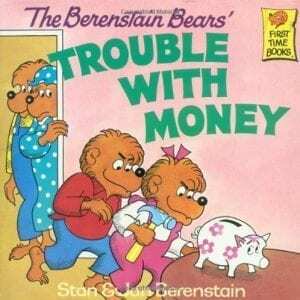 The Berenstain Bears’ Trouble with Money (tier 2) by Stan and Jan Berenstain is a cute story of the cubs’ transformation from spendthrifts to wise businessmen to generous givers. It will hopefully encourage your kids to think outside the box in terms of earning money, but also to be generous with what they have. 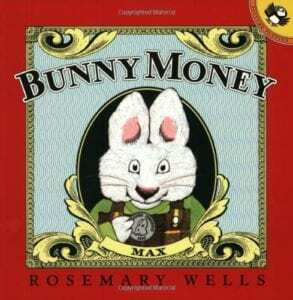 Bunny Money (tier 2) by Rosemary Wells is such a cute Max and Ruby story. It will teach kids to think and plan before they start spending. Also included is “bunny money” that you can photo copy to play with at home. 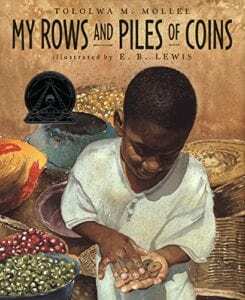 My Rows and Piles of Coins (tier 3) by Tololwa Mollel is a great way to teach kids about another culture and show them that kids all around the world have to save up their coins when they want to buy something special. This story takes place in Tanzania, and includes information at the back of the book on Tanzanian money. 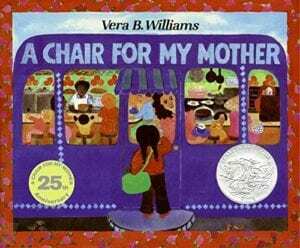 A Chair for My Mother (tier 3) by Vera Williams is another great story about a child saving their money. It tells of a family who lost everything in a fire and the ways that neighbors helped provide, as well as the long hard work required to save up for a new chair. These books would be great for older kids interested in learning more in-depth concepts such as the ins and outs of the stock market, interest, etc. They are more like chapter books, with few pictures, but are still kid friendly in explaining difficult topics. The Everything Kid’s Money Book (tier 1) by Brette Sember covers just what the title suggests: everything! This is a great resource, full of facts for kids as well as lots of fun activities and games. 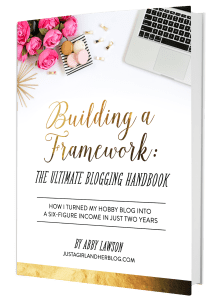 Did you find this list helpful? Then you'll love the handy printable version I've made! Just print out the book list, take it to the library, and check them off as you read them. Plus, this set includes 2 pages of books not included in my blog series! That's 8 lists of engaging math stories in all. You will also be added to my email list to receive teaching tips, freebies and special offers. Success! Now please check your email to grab your free book lists and confirm your subscription. I'm so glad to have you! What a fabulous list! We love The Coin Counting Book-can’t wait to check out the rest. Thank you! We have taken books out of the library from your other lists, and are now ready to tackle money! These lists are fantastic. Thank you so much! Thank you so much for these lists of books!. We homeschool and do a lot of literature based learning and these are a huge blessing! Hi Mindi, Thank you for your kind words! I do not currently have a printable version of the book lists, but that is an excellent idea! I will add it to my to-do list 🙂 Thanks for the suggestion!